Thank you to members of the Flannel Friday Facebook page for helping me get my act together with this program and for giving me some more scarf ideas that I am going to be trying out on my 2 and up groups soon. It's always great to add something new to your programs, and I think this is going to become a regular periodic feature of my toddler programs! It's dark and gray and awful out there and I wanted to do something different and BRIGHT with my "Mother Goose" groups. So I pulled out the juggling scarves I use with the 2 and up set for "Nutcracker" and for other fun programs and decided to try them out. In addition to the fact that the one year old set are just developing body control, they are not ready to follow directions in a group. For that you need cooperative parents and caregivers to guide them. And while some of my families/nannies are great, but others just sit there and watch their kids run amuck and don't even TRY to take part. Sigh..
1)Opening:I started with letting everyone pick a scarf--or two, since we had plenty. And as they did, I commented on the colors--"Oh,look, Sienna is taking a yellow scarf and you have yellow stripes on your shirt!" Then I put the rest of the scarves in a pile on the floor and let the kids grab as they liked. We only interfered if they tried to take scarves from each other. 2)"If You're Happy and You Know It" I don't think of this as a piggyback song, it's just doing different actions with a prop. And it works perfectly with scarves. We did "shake your scarf" and "wave your scarf", "throw your scarf" (juggling scarves float beautifully) and "play peek-a-boo!" You can also play "Hide your scarf" and scrunch your scarf in your hands or hide it behind your back. 3)"I Can Sing A Rainbow" If you are shy about singing, you can find great versions of this song. Two of my favorites are Fred Penner and "Wiggleworms"--you can hear a clip of their version HERE. I pretty much just sang this song while I tossed different color scarves in the air and those who felt like rocking with their kids did so. I thought of a flannel board for this, but the colors are not really the rainbow colors (pink instead of brown) and they're not in sequence, and they liked it just as it was. I need to find the guitar chords and try this on my ukelele! 4)"All My Colors" Ralph Covert, I really want to give you a haircut because I think you look like John Cleese of Monty Python as "Anne Elk--Miss! ", but I am in love with your music. This is irresistable to run around to, dancing and waving scarves and a lot of my close to 2 toddlers really grooved out to this. I kept throwing scarves in the air in various spots when I wasn't dancing. 5)Des Colores There are lots of versions of this, but I used the Raffi one and all my Spanish speaking nannies not only knew the words, they sang along and danced their kids. There will be more Spanish songs at programs and I think I have to get on doing some bi-lingual stuff. They'll be able to laugh at my Spanish! 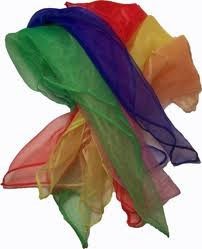 6)Closing--Sort Of After we did Des Colores, I just had them hold onto the scarves or drop them as they liked while we played "Ring Around the Rosie". During "Wheels On the Bus" we added "The kids on the bus wave Hi! Hi! Hi!" and waved the scarves. We did the closing bounces and I told the parents/nannies I wanted to see if we could get all the scarves back in the box, but if not, try to just leave them in the room. To my delight, no one fussed and the kids had fun putting the scarves away! This was all so much fun that I added it to my 2 and up program. It was a North Pole/South Pole theme, but in the middle, we did the recorded music and then I told the kids we'd danced all the way from the South Pole to the North! It sounds like you all had fun!!! I am so jealous that you know how to speak Spanish too!! Thanks, Donnaquilt, but no, I'm not a Spanish speaker. I can understand a fair bit of it, especially in reading because I have some background in French. But I think I can do some Spanish songs and basic fingerplays, and it would be cool if the nannies were the ones helping ME! I also took Russian for 2 years and didn't do well at it, but acquired some basic words and phrases. Which helped this very week when I had a Russian nanny and was able to ask her charge's name! I've never used scarves before in story time. Tell me, do you wash them after each use, and if so, how do they stand up to the abuse? They are gauze juggling scarves and I've never washed them--not sure how they'd handle it. I have a bunch I bought some years ago from Oriental Trading, and they've been great. I recently bought some more and they seem different--stiffer. May rinse them out to see if they soften. But unless you're working with kids who have just done a messy craft or something, I wouldn't worry about them getting dirty or such--ours have been fine for ages. For older kids--say three and up-- you can take elastic hair ties and knot the scarves to them--or some kind of plastic rings that the kids can hold onto. It makes the scarves extra easy to handle, but I don't think they're good with kids this little. can't read text over print background. May have been some good info here but I can't read it. I don't use Apple products, but I have checked this via Firefox and IE, with my Android phone and my Win8 tablet. Looks fine on all of them. And evidently you were able to read the comments box at least. Thank you so much for sharing the ideas. Each of them seems fun! It's good to hear a refreshing version of rainbow song. By the way, am using chrome on Mac Pro and your website is just fine.